FIFA has fined the national football team for their patriotic display of the Tamim Al Majd picture during World Cup qualifier. Qatar’s national football team was penalized with a QR 188,800 ($51,000) fee by FIFA for getting political during a 2018 World Cup qualifier against Korean last month. 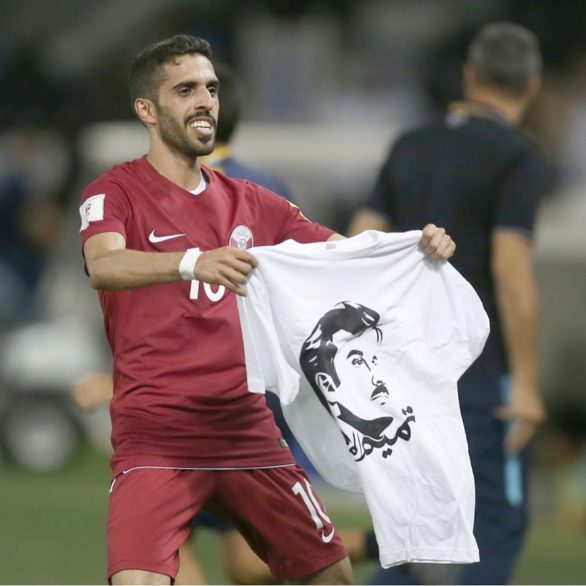 Prior to the match, players from the national team were seen warming up in T-shirts with Tamim Al Majd prints on them. Tamim Al Majd is a portrait of the Emir of Qatar, Sheikh Tamim bin Hamad Al Thani, created by Qatari artist Ahmed Majid Al Ali Al Ma’adid, and has become a banner representing loyalty, support and love for the Emir and the nation. The players weren’t the only ones displaying images of the Emir at the Jassim bin Hamad Stadium. Audience members, both Qatari and Korean, also wore T-shirts and waved banners with the Tamim Al Majd picture. Player Hasan Khalid Alhaydos was also charged with an individual QR 18,700 fine for “unsporting behavior.” After scoring the opening goal, AlHaydos grabbed a T-shirt from a spectator and lifted it up high in the air. FIFA said that the sanctions were due to “displaying a political image” and “political displays” by both players and fans. FIFA’s rules and regulations prohibit any form of politicization during or prior to a match. However, the game against South Korea ended in victory, with a 3-2 final score in Qatar’s favor. In order to qualify, Qatar will need to win both games, while Uzbekistan will have to lose their two games.